MYRTLE BEACH, S.C. (August 29, 2016) - The Myrtle Beach Pelicans and Chicago Cubs have signed a four-year extension of their Player Development Contract. 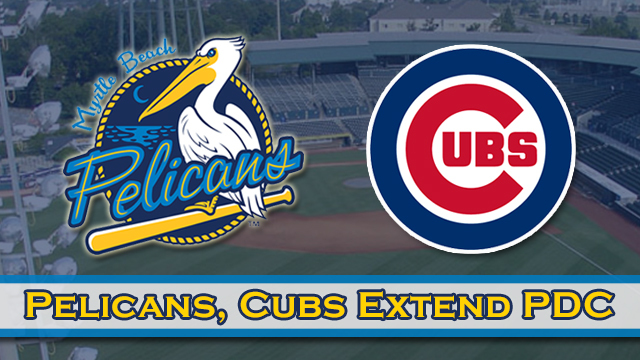 The agreement will keep the Pelicans as the Class A-Advanced affiliate of the Cubs through the 2020 season. "We're thrilled to extend our affiliation with the Cubs for four more years and continue our partnership with one of the most beloved and historic franchises in all of sports," said Pelicans' Chairman & Managing Partner Chuck Greenberg. "We're grateful that the Cubs have welcomed the Pelicans and the city of Myrtle Beach into their family and the player development staff, coaches and players that we've worked with on a daily basis the past two seasons have gone above and beyond to embrace our community and our great fans." In their first year of a new affiliation with the Cubs in 2015, Myrtle Beach won the Carolina League championship, the franchise's first title since the 2000 season. In addition, the Pelicans began the 2016 campaign with two of Chicago's then-top three prospects in infielders Ian Happ and Gleyber Torres. Backed by the strong Cubs organization, which ESPN rated as the No. 4 farm system in baseball prior to the season, Myrtle Beach will be making its sixth consecutive trip to the postseason in September, the longest run of any franchise in the Carolina League. "Myrtle Beach has been a great partner the past two seasons and we are pleased to extend our relationship with the organization," said Cubs Senior Vice President of Scouting and Player Development Jason McLeod. "Led by Chuck Greenberg and Andy Milovich, the Myrtle Beach front office has provided a very positive experience for our Single-A players both at the ballpark and in the community. We wish them the best of luck as they head into the postseason and aim for their second-straight Carolina League title." Pelicans from the 2015 and 2016 seasons currently make up five of the top eight and 12 of the top 30 prospects in the Chicago Cubs organization, according to MLB.com. In addition, left-handed pitcher Gerardo Concepcion and infielder Jeimer Candelario became the first players in club history this summer to rise through the organization as Cubs farmhands and make their major league debut with Chicago. "Our partnership with the Chicago Cubs has been incredible in every respect," Pelicans President/General Manager Andy Milovich said. "Their commitment to player development on and off the field is unparalleled. It's an incredible organization and an exciting time to be a member of the Cubs family." Three players on the Cubs' major league roster - outfielder Jason Heyward and right-handed pitchers Kyle Hendricks and Justin Grimm - played with Myrtle Beach on their way up to The Show before making their major league debuts. Outfielders Jorge Soler and Chris Denorfia also completed rehab assignments with the Pelicans in 2015. "The community has truly embraced the Cubs affiliation," Milovich said. "The volume of fans in Cubs gear at TicketReturn.Com Field has been overwhelming. The Chicago Cubs and Myrtle Beach are an incredible combination and it's humbling to play a role in such a great partnership in an amazing community like Myrtle Beach." The Pelicans clinched the Southern Division's second-half playoff spot Wednesday at Carolina. Playoff ticket packages are now available by calling (843) 9018-6000 or by visiting www.MyrtleBeachPelicans.com. Myrtle Beach completes its regular season home slate by beginning a three-game series Tuesday at 7:05 p.m. against the Lynchburg Hillcats. The 2016 season is the 18th season for the Pelicans franchise and second as the Class A-Advanced affiliate of the Chicago Cubs. For information on tickets to see the Pelicans in 2016, please call (843) 918-6000, e-mail info@myrtlebeachpelicans.com, or visit www.MyrtleBeachPelicans.com. ABOUT THE PELICANS: The Myrtle Beach Pelicans are the Class A-Advanced affiliate of the Chicago Cubs and play their home games at TicketReturn.Com Field at Pelicans Ballpark in Myrtle Beach, South Carolina. The park has ranked in the top eight in all of Minor League Baseball by Stadium Journey in each of the last five seasons. The same publication also placed the Pelicans in the Top 100 Stadium Experiences in all of sports in each of the last five years and the best in the Carolina League for five straight seasons as well. In May 2015, TicketReturn.Com Field at Pelicans Ballpark won the 2015 TripAdvisor.com Certificate of Excellence award. The Pelicans are the defending Mills Cup Champions, winning the title in 2015 as well as 2000 and co-Mills Cup championship honors in the inaugural 1999 season. The Pelicans have made nine postseason appearances behind 11 half-season Southern Division championships, including the first half of the 2015 season, as well as five Southern Division titles, most recently in 2015. For more information on the Myrtle Beach Pelicans, please contact the Pelicans at (843) 918-6000 or emailing Info@MyrtleBeachPelicans.com.